Ever since my daughter started reading chapter books this summer, I feel like I’ve become well-versed in middle grade literature. There’s been a push for more diversity in kids lit and I’m all too excited to find books with Asian characters. 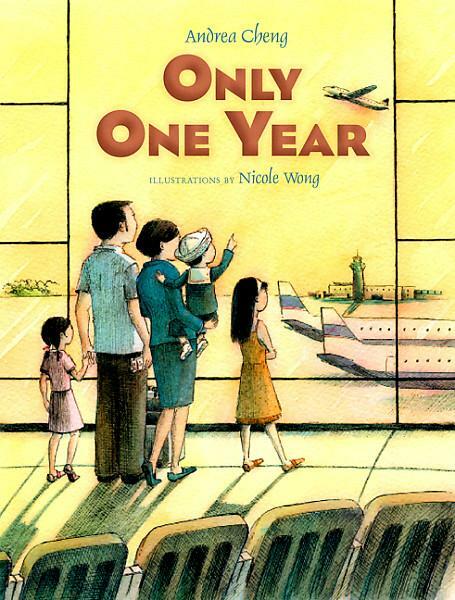 A recently discovered favorite (that was actually published several years ago) is Andrea Cheng’s Only One Year (Lee & Low, 2010). Sharon and Mary are grade school students (fourth and first grade, respectively) who live in the US with their parents and their two year-old brother, Di Di. When their mother goes back to work full-time, there is no one to take care of Di Di. So the parents decide to send him to China to live with grandma for a year. The girls, thoroughly American, don’t understand their parents’ decision to send Di Di to China. But as the time passes that year, they talk about him less and less. When he returns to America with his grandmother, he is shy and doesn’t want to leave her side. He doesn’t remember his parents or sisters, and doesn’t speak English. I read that Andrea Cheng wrote this book because although her own parents raised her in the US, she wanted to show how other cultures view childcare. Is it better for children to be with family or strangers? If you’ve read Good Chinese Wife, you might be wondering why I would find this book endearing. After all, I left my marriage to save Jake from a childhood in China. Fast-forward fourteen years. As Jake is now living halfway around the world, albeit in high school and not as a two year-old, I find myself explaining to people why I would agree to this arrangement. Maybe it’s a Jewish thing (sending kids to Israel) or maybe it’s because I did my research and feel completely comfortable with the program he’s on. But the bottom line is that I can trust. And that was not a luxury I enjoyed in Good Chinese Wife.